As new versions of the Sonifex product handbooks are released, they will be available here for you to download and print. If the handbook you require is not listed here, please contact Sonifex with your request. You may require a copy of Adobe's Acrobat Reader to view and print the handbooks, which is available free from Adobe's website. 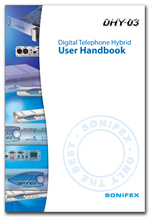 If you require a handbook that is not listed here, please contact technical.support@sonifex.co.uk with your requirements.